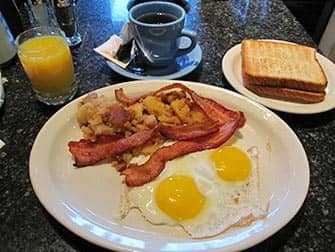 Looking for breakfast in New York? Real New Yorkers eat breakfast on the go. Between the subway and the office, there are countless carts where lots of different things are sold. Going for coffee? Always order your coffee without milk! Otherwise, you will be served a cup with low-fat milk, which is very watery and will make your coffee tasteless. When ordering from one of these carts, beware that they are often impatient and hate when people take too long when ordering. However, it’s much nicer to eat in a diner. These can be found in every part of the city. I recommend eating at a diner at least once during your New York trip for the ultimate American experience. Breakfast in diners is cheap. 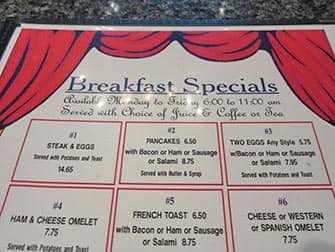 You can get two eggs with toast, potatoes, bacon, coffee, and juice for no more than $8 or $9. Tipping is important when eating at a diner. For paying the tip: give about twice the amount of the tax (found on the receipt). 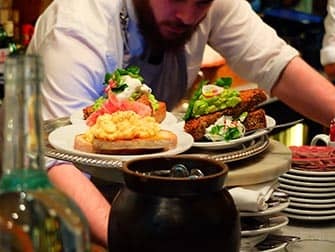 A normal tip is about 15% to 20% of the bill, without the tax. Check your receipt to see if the tip has been included or not. 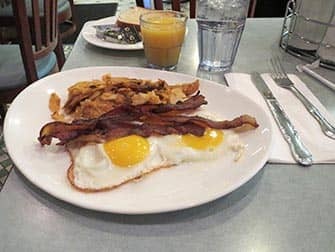 Eric’s Tip: This is how a real New Yorker orders breakfast: “Can I have two eggs sunny side up, white toast, bacon, coffee, and a small OJ?” A fried egg means “sunny side up.” At diners, you always just pay for one cup of coffee (even if you order the breakfast special at $4.50!). You can get an unlimited amount of refills, but with tea you just get more hot water—so keep your teabag. 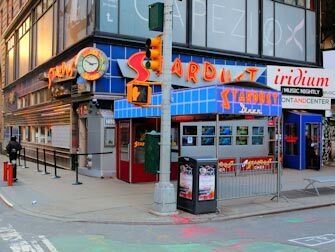 If you are looking for something special, go to Ellen’s Stardust Diner on Broadway and 51st Street (near Times Square). The unique feature of this restaurant is that all of the waiting staff sing. This also makes for a free Broadway show! 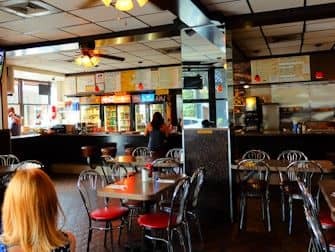 Most of the waiters and waitresses leave after just a few months in order to perform in real musicals in New York, so this diner is just a stepping stone for them. 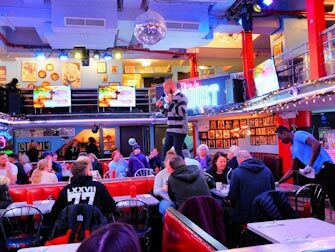 The best time to arrive at Ellen’s Stardust Diner is between 08:00 and 08:30. After that, it will be very busy. They usually start singing around 08:00 on weekdays (and on weekends they will start later). Breakfast at Ellen’s Stardust Diner is more expensive than your regular diner, starting from $15. 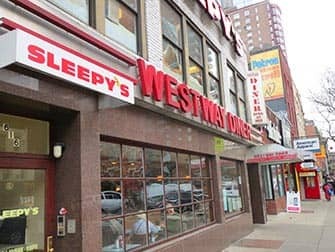 Westway Diner was established in 1988 and is open 24/7. 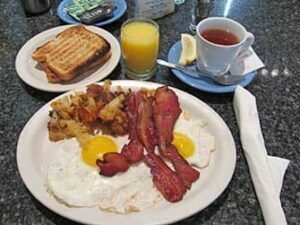 It’s a typical diner: the food is simple and served very quickly. You really have to know what you want to order before you order as the waiting staff are always in a rush. Don’t order a la carte at this place but a ‘menu’ that includes coffee and orange juice, which is much cheaper. You can only order one of those menus Monday through Friday though. 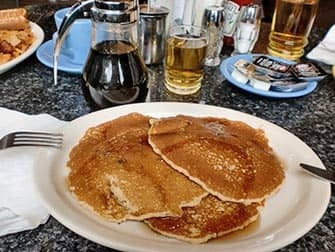 Hector’s Cafe & Diner (1949) is one of the last real ‘old school’ diners in New York. It’s an oasis in the hip and touristic Meatpacking District. Hector’s is raw, ugly and cheap. Something that’s hard to find in Meatpacking these days. 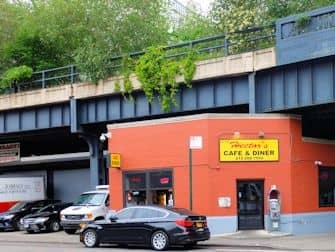 Martin Scorsese used Hector’s as a set for Taxi Driver and they’ve also filmed at Hector’s for the tv-series Law & Order. Go visit Hector’s to feel like the meat processors, drug addicts and dealers that claimed this area for ages. Choose Hector’s instead of the nearby Bubby’s, because Hector’s hasn’t been created for tourists. Or actually, don’t go to Hector’s! Let Hector’s remain the raw diamond of the city. 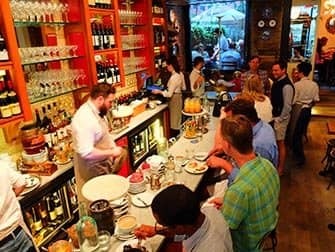 Theatre Row is one of the trendiest diners in New York. Because of it’s location in the theatre district, many (up and coming) Broadway actors dine here. The reason I really like it is because it’s cheap (mon-fri). And the pancakes and waffles are really good too! The diner is open from 06:00 till 01:00. Tom’s Restaurant is a family-owned restaurant that has been open since the 1940s. 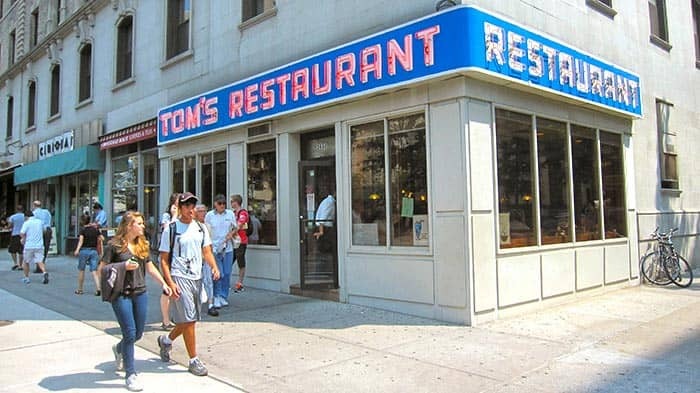 It’s located in Morningside Heights and was the diner that was used in the show Seinfeld. That’s pretty much the only reason I like to go to this diner. Are you looking for a nice place in Greenwich Village? Then go to Buvette. A small, bustling, Parisian-style bistro. The staff works hard and has a passion for good food and French wines. Many mornings I order an espresso with a croissant and sit at the bar. In the tiny kitchen they prepare typical French dishes. 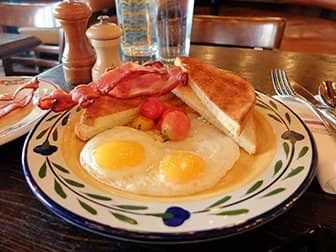 This bistro is a fine spot for a tasty breakfast or brunch. Choose waffles, toast with various generous toppings, a ham and cheese sandwich or a salad with a freshly squeezed juice on the side. If you prefer to sit outside, there is also a little garden. Buvette is open from early morning until late at night. Eric’s Tip: This is a nice bistro for breakfast or brunch. But note: it’s small and often busy too. Since you can’t make reservations, you might have to wait before you’ll get a spot. If you’re there anyway, do visit the toilet to test the deliciously scented hand soap! 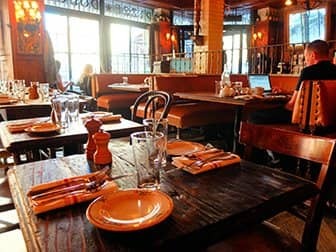 In East Village, Lower Manhattan you can find the Bowery Hotel with it’s Italian restaurant: Gemma. 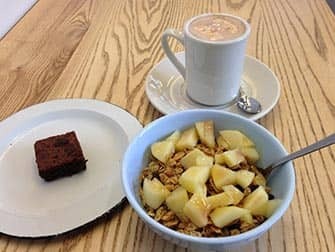 Even though celebrity sightings are commonplace at Gemma, you can still eat breakfast here for a relatively low price. Start off your day for around $8 with the ‘two eggs any style’ and for an extra $5 you can even add bacon. If you have more of a sweet tooth in the mornings, go for the pancakes or the french toast.